Upper gastrointestinal bleeding (UGIB) is defined as hemorrhage that emanates proximal to the ligament of Treitz. It is a common and potentially life-threatening condition. Despite evidence of declining incidence and mortality rates, UGIB remains a significant cause of morbidity and mortality, with 100 episodes per 100,000 admissions annually in the United States and mortality rates as high as 14%. Although more than 75% of cases of bleeding cease with supportive measures, a significant percentage of patients require further intervention, which often involves the combined efforts of gastroenterologists, surgeons, and interventional radiologists. Imaging is playing a growing role in the management of acute GI bleeding by localizing the source of bleeding, differentiating the underlying disease processes, and aiding decisions to proceed to endovascular therapies to treat many causes of GI bleeding. Case 1. Celiac arteriogram obtained in a patient with duodenal ulcer bleeding that was documented endoscopically reveals standard celiac anatomy. No obvious hemorrhage from the gastroduodenal artery is seen. Bleeding from duodenal leiomyoma. Gastroduodenal arteriogram showing a duodenal mass with active contrast extravasation (arrow). Duodenal resected specimen showing a submucosal mass with a central ulceration (arrow) (same patient as previous image). The first decision point in managing GI bleeding is defining the site and cause of bleeding: is it an upper GI or a lower GI hemorrhage? Patients with upper GI tract bleeding will be triaged to upper endoscopy, the initial procedure of choice, while those with lower tract bleeding will be evaluated with imaging or colonoscopy depending on the clinical scenario. If endoscopy has failed to reveal a bleeding source or if the bleeding cannot be controlled, angiography is used for diagnosis and therapy. Angiography has been shown to depict the source with bleeding rates as low as 0.5 mL/min. If no active bleeding is identified angiographically in a patient with documented recurrent bleeding by endoscopy, prophylactic embolization of the left gastric artery or the gastroduodenal artery may be performed to control gastric or pyloroduodenal bleeding, respectively. 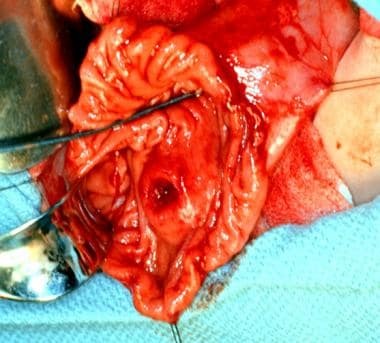 With advances in both endoscopic and angiographic techniques, surgical options are often limited in acute UGIB because of its associated morbidity and mortality. In the setting of recurrent variceal bleeding that is refractory to endoscopic control, the use of transjugular intrahepatic portosystemic shunts (TIPS) is preferred in the management of patients with a Child class B condition and in some with a Child class C condition. Currently, upper GI barium examinations have no role in the diagnosis of acute UGIB. Endoscopy is often the first-line diagnostic examination and treatment option for upper gastrointestinal bleeding. However, findings can be nondiagnostic in about 10% of cases. Endoscopy may not be readily available in the emergency room setting. For patients with high-volume bleeding, it may be impossible to adequately visualize the source of hemorrhage with endoscopy. In addition, for those with lower GI tract bleeding, endoscopy is unable to assess the majority of the small bowel distal to the ligament of Treitz and provides limited visualization of the distal duodenum. Disadvantages of CTA include relatively high radiation dose and the need for IV contrast. Because of the short acquisition time, false-negative results can occur if the patient is not bleeding at the time of the scan. Angiography is limited by the rate of bleeding, which usually must be at least 0.5 mL/min before it is detected. Its accuracy in the detection of acute UGIB is 90%, and it is helpful in assessing occult UGIB. A positive angiographic finding of bleeding is needed to initiate embolization, except in cases in which bleeding has been localized before—for example, in the left gastric artery (LGA) or gastroduodenal artery. In these situations, prophylactic embolization is helpful. Prophylactic embolization of the LGA without prior documented bleeding is advocated because almost 90% of patients with this condition survive if the bleeding is controlled. The left gastric artery is involved in 85% of cases of UGIB. When endoscopy identifies the presence and location of bleeding but bleeding cannot be controlled endoscopically, catheter-based arteriography with treatment is an appropriate next study; computed tomography angiography (CTA) is comparable to angiography as a diagnostic next step. If endoscopy demonstrates a bleed but the endoscopist cannot identify the bleeding source, angiography or CTA can be performed and both are considered appropriate. In the event of an obscure UGIB, angiography and CTA have been shown to be equivalent in identifying the bleeding source; CT enterography may be an alternative to CTA to find an intermittent bleeding source. When endoscopy is contraindicated, primary angiography, CTA, and CT with IV contrast are considered appropriate. For patient education information, see the Esophagus, Stomach, and Intestine Center, as well as Gastrointestinal Bleeding. 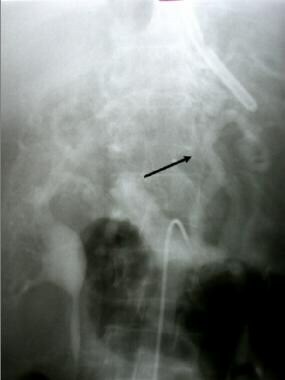 The radiographic findings, as outlined above, are usually nonspecific. Calcifications associated with aneurysms, in the aorta or branch vessels, are reliable but rare findings regarding a source of upper gastrointestinal bleeding. 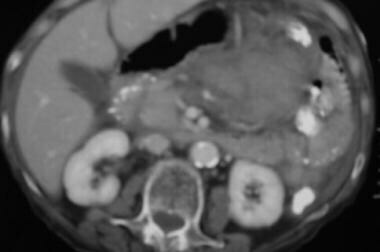 Small pseudoaneurysms, small bowel tumors, and small biliary tumors can easily be missed by CT. In the catastrophic situation of aortoenteric fistula, CT may be helpful in detecting an early leak. The usual drawbacks of upper abdominal CT for the evaluation of subtle lesions also apply to the use of this modality in the evaluation of upper gastrointestinal bleeding. These include underopacification of bowel loops, suboptimal visualization of the biliary system and small visceral aneurysms, and difficulty in evaluating the esophagus. Case 4. 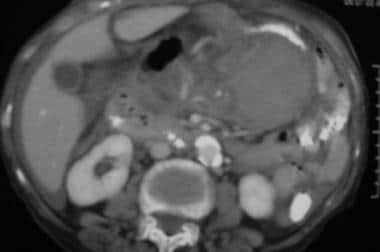 CT scan obtained in a 45-year-old man with acute hematemesis reveals a left upper quadrant acute mesenteric and lesser sac hemorrhage. Case 4. CT image caudal to previous image reveals acute hemorrhage. Case 4. Image obtained with a selective common hepatic artery injection reveals a pseudoaneurysm in the right gastric artery, which arises from the proper hepatic artery. The pseudoaneurysm has the appearance of a double density that overlaps the origin of the gastroduodenal artery in this projection. Case 4. Image in a left anterior oblique projection compared with the orientation of the diagnostic angiogram depicts selective embolization of the pseudoaneurysm of the right gastric artery with coils. The patient had no further bleeding. In the setting of portal hypertension, the presence of varices and the patency of the portal and splenic veins can be evaluated prior to a transjugular intrahepatic portosystemic shunt (TIPS) procedure or splenic artery embolization. MRI has a limited role in the evaluation of acute upper gastrointestinal bleeding (UGIB) from arterial sources. In the setting of aneurysms and pseudoaneurysm, magnetic resonance angiography (MRA) may be helpful in depicting the vascular abnormalities. With magnetic resonance cholangiography, the depiction of subtle biliary abnormalities may be helpful in cases of hemobilia. MRI is comparable to CT in the evaluation of masses that cause UGIB. Similar to CT, MRI has no real role in the assessment of acute upper gastrointestinal bleeding. It may be helpful in depicting small visceral pseudoaneurysms or masses, but a normal MRI finding is often only a starting point for further investigation. Endoscopic evaluation is critical in providing information for subsequent angiography. For example, if variceal bleeding is suspected instead of arterial bleeding, endoscopy can be used to guide subsequent therapy in favor of a transjugular intrahepatic portosystemic shunt (TIPS) procedure. In cases such as hemorrhagic gastritis (shown in the images below), which is an important cause of UGIB caused by physiologic stress, the endoscopic diagnosis can guide subsequent vasopressin infusion. If a mass or recurrent bleeding from a suspected ulcer in the duodenum is present, the gastroduodenal artery can be embolized. Case 2. Selective left gastric arteriogram obtained in a patient with cirrhosis, recent upper GI bleeding, and esophageal ulcers, with diffuse hemorrhagic gastritis as demonstrated at recent endoscopy. Case 2. Because the patient was known to have diffuse hemorrhagic gastritis, as assessed with endoscopy, vasopressin infusion was begun at 0.2 U/min. Follow-up angiogram reveals a decrease in vascularity to the stomach. Vasopressin was continued overnight, with the patient in the ICU. The patient weaned from the medication over the following 24 hours without a recurrence of bleeding. Angiographic evaluation of UGIB is usually performed via common femoral artery access achieved with the Seldinger technique. A catheter is directed into the celiac artery and superior mesenteric artery for angiography. Prior diagnostic examinations such as endoscopy or CT can be used to guide subsequent catheterization. Acute arterial bleeding is seen as the extravasation of contrast medium of arterial opacity at the bleeding site. The extravasating contrast agent frequently flows toward the dependent part of the viscous, creating the pseudovein appearance. If the bleeding is demonstrated on the celiac or superior mesenteric angiogram, a more selective injection of the extravasating artery (superselective catheterization) is performed for confirmation of the bleeding and embolization. If contrast agent extravasation is not seen with the selective injections, superselective catheterization of the gastroduodenal, left gastric, and splenic arteries is performed. 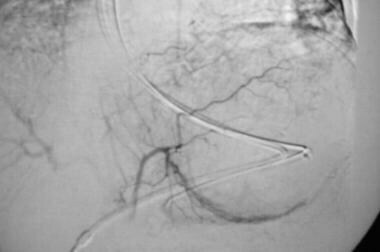 Angiography is insensitive in the detection of venous bleeding, such as variceal hemorrhage from portal hypertension. Clinical suspicion and endoscopic findings are helpful in evaluating variceal bleeds. However, angiography can be helpful in the detection of as much as 50% of occult UGIB. Hemosuccus pancreaticus in patient with upper GI hemorrhage. Splenic artery aneurysm with bleeding into the pancreatic duct (arrow). Variceal bleeding in a patient with hepatocellular carcinoma invading the portal vein. Threads and streaks sign (arrow) indicating portal vein invasion by hepatoma. 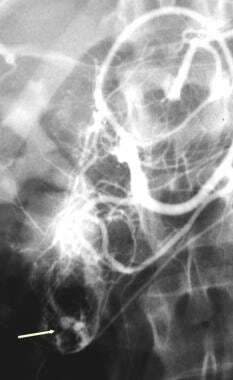 Portal venous phase of a superior mesenteric angiogram showing portal vein occlusion and gastroesophageal varices (arrow) (same patient as previous image). The degree of confidence in the angiographic diagnosis of upper gastrointestinal bleeding is high. Arteriography can be used to accurately identify 90% of acute UGIB. It is also useful in depicting occult bleeding in 50% of patients. However, a bleeding rate of 0.5-1.0 mL/min is required for the angiographic depiction of hemorrhage. Venous bleeding (eg, from variceal bleeding) is difficult to detect with angiography. Bowel motion, prior barium examinations, and abnormal staining from inflammation or breathing artifact can hinder angiographic depiction of bleeding. Multiple superselective injections may be required for a confident diagnosis. A bleeding rate of 0.5-1.0 mL/min is required to visualize angiographic hemorrhage; otherwise, a false-negative angiogram results. Alternatively, if the bleeding has stopped at the time of study, the clinical parameters may be helpful in this distinction. Venous hemorrhage from portal hypertension might be another cause of false-negative findings. [Guideline] Expert Panels on Vascular Imaging and Gastrointestinal Imaging:., Singh-Bhinder N, Kim DH, Holly BP, Johnson PT, Hanley M, et al. ACR Appropriateness Criteria® Nonvariceal Upper Gastrointestinal Bleeding. J Am Coll Radiol. 2017 May. 14 (5S):S177-S188. [Medline]. [Full Text]. [Guideline] Gerson LB, Fidler JL, Cave DR, Leighton JA. ACG Clinical Guideline: Diagnosis and Management of Small Bowel Bleeding. Am J Gastroenterol. 2015 Sep. 110 (9):1265-87; quiz 1288. [Medline]. [Full Text]. Tammaro L, Di Paolo MC, Zullo A, Hassan C, Morini S, Caliendo S, et al. Endoscopic findings in patients with upper gastrointestinal bleeding clinically classified into three risk groups prior to endoscopy. World J Gastroenterol. 2008 Aug 28. 14(32):5046-50. [Medline]. Hakimian S, Jawaid S, Guilarte-Walker Y, Mathew J, Cave D. Video capsule endoscopy as a tool for evaluation of obscure overt gastrointestinal bleeding in the intensive care unit. Endosc Int Open. 2018 Aug. 6 (8):E989-E993. [Medline]. [Full Text]. Sung JJ, Tang RS, Ching JY, Rainer TH, Lau JY. Use of capsule endoscopy in the emergency department as a triage of patients with GI bleeding. Gastrointest Endosc. 2016 Dec. 84 (6):907-913. [Medline]. Wortman JR, Landman W, Fulwadhva UP, Viscomi SG, Sodickson AD. CT angiography for acute gastrointestinal bleeding: what the radiologist needs to know. Br J Radiol. 2017 Jul. 90 (1075):20170076. [Medline]. [Full Text]. Lefkovitz Z, Cappell MS, Kaplan M. Radiology in the diagnosis and therapy of gastrointestinal bleeding. Gastroenterol Clin North Am. 2000 Jun. 29(2):489-512. [Medline]. Schillaci O, Spanu A, Tagliabue L, Filippi L, Danieli R, Palumbo B, et al. SPECT/CT with a hybrid imaging system in the study of lower gastrointestinal bleeding with technetium-99m red blood cells. Q J Nucl Med Mol Imaging. 2008 Jul 3. [Medline]. Soto JA, Park SH, Fletcher JG, Fidler JL. Gastrointestinal hemorrhage: evaluation with MDCT. Abdom Imaging. 2015 Jun. 40 (5):993-1009. [Medline]. [Guideline] Dam HQ, Brandon DC, Grantham VV, Hilson AJ, Howarth DM, Maurer AH, et al. The SNMMI procedure standard/EANM practice guideline for gastrointestinal bleeding scintigraphy 2.0. J Nucl Med Technol. 2014 Dec. 42 (4):308-17. [Medline]. [Full Text]. Ettorre GC, Francioso G, Garribba AP. Helical CT angiography in gastrointestinal bleeding of obscure origin. AJR Am J Roentgenol. 1997 Mar. 168(3):727-31. [Medline]. Hawkins IF, Caridi JG, LeVeen RF. Use of carbon dioxide for the detection of gastrointestinal bleeding. In: Techniques in Vascular and Interventional Radiology. 2000: 130-8. Laing CJ, Tobias T, Rosenblum DI, Banker WL, Tseng L, Tamarkin SW. Acute gastrointestinal bleeding: emerging role of multidetector CT angiography and review of current imaging techniques. Radiographics. 2007 Jul-Aug. 27(4):1055-70. [Medline]. Artigas JM, Martí M, Soto JA, Esteban H, Pinilla I, Guillén E. Multidetector CT angiography for acute gastrointestinal bleeding: technique and findings. Radiographics. 2013 Sep-Oct. 33(5):1453-70. [Medline]. Nakamura S, Matsumoto T, Sugimori H, Esaki M, Kitazono T, Hashizume M. Emergency endoscopy for acute gastrointestinal bleeding: Prognostic value of endoscopic hemostasis and the AIMS65 score in Japanese patients. Dig Endosc. 2013 Oct 29. [Medline]. Saad WE, Wagner CC, Lippert A, Al-Osaimi A, Davies MG, Matsumoto AH, et al. Protective Value of TIPS Against the Development of Hydrothorax/Ascites and Upper Gastrointestinal Bleeding after Balloon-Occluded Retrograde Transvenous Obliteration (BRTO). Am J Gastroenterol. 2013 Oct. 108(10):1612-9. [Medline]. Case 1. Image depicts selective catheterization of gastroduodenal artery (GDA). Attenuation of the GDA is secondary to recent hemorrhage and vasospasm. Case 1. Image obtained in a patient with recurrent duodenal ulcer bleeding depicts selective embolization of the gastroduodenal artery with coils. When prophylactic embolization is performed in duodenal bleeding, one may embolize the proximal gastroepiploic artery with coils to protect the stomach, and then embolize the branches of the gastroduodenal artery with either Ivalon or Gelfoam. Case 1. Arterial-phase image obtained with selective injection of the superior mesenteric artery shows no contribution of the inferior pancreaticoduodenal arcade to the duodenal ulcer; thus, no embolization was performed. Injecting the appropriate collaterals in upper GI bleeding is important to prevent further hemorrhage. Case 1. Late-arterial phase superior mesenteric angiogram shows no contribution of the superior mesenteric artery to the duodenal ulcer hemorrhage. Case 3. 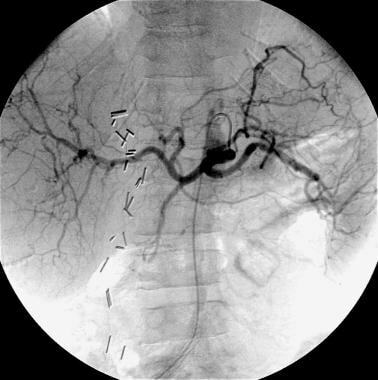 Selective celiac arteriogram reveals active bleeding in the stomach from a branch of the left gastric artery along the greater curvature of the stomach. Case 3. 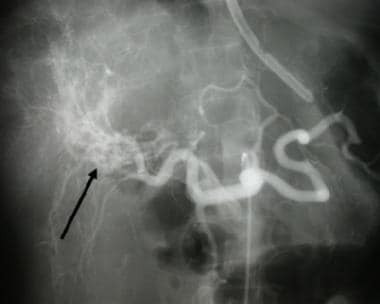 Image obtained with a selective injection of the feeding vessel of the left gastric artery shows extravasation of contrast material into the dependent portion of the stomach; this finding is the pseudovein sign. Case 3. 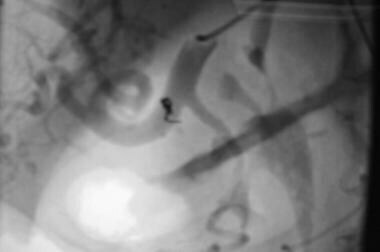 Image depicts superselective angiography and embolization of branch vessel of the left gastric artery with a platinum coil using a 3F microcatheter. A persistent pseudovein sign is shown. Case 3. Image obtained with a selective gastroduodenal artery injection with filling of the right gastroepiploic artery shows that small branches fill the bleeding vessel along the greater curvature of the stomach. Case 3. Embolization of the right gastroepiploic artery with Gelfoam and a single embolization coil. Case 3. Image obtained with a final superior mesenteric arterial injection to evaluate the collateral contribution to bleeding. Case 5. 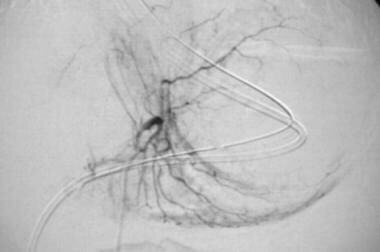 Portal venogram obtained in a patient with gastric variceal bleeding before the placement of a transjugular intrahepatic portosystemic shunt shows large gastric varices. Case 5. Venogram obtained after the placement of a 12-mm transjugular intrahepatic portosystemic shunt and selective coil embolization of gastric varices. 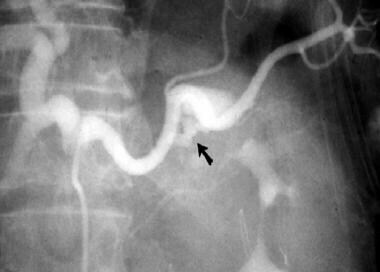 Gastroduodenal arteriogram with a pancreatic pseudoaneurysm (arrow). 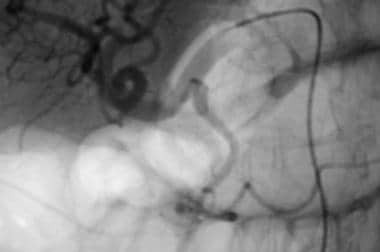 Control of upper GI hemorrhage by coil occlusion of the pancreatic artery pseudoaneurysm (arrow) (same patient as previous image). Disclosure: Received consulting fee from Teleflex Medical for consulting.